We apologize, but we are currently sold out of Tartan. 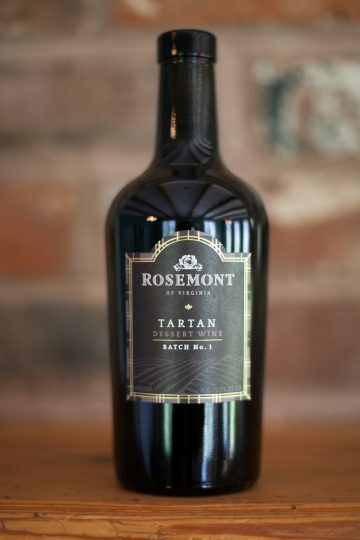 Tartan is our port-style wine that has been fortified with Brandy and infused with blueberry wine created from the blueberries grown on the Rosemont Farm. Batch No. 2 has aged for 7 years and you’ll find that this batch is much more reminiscent of a Tawny Port. It is a beautiful balance between Merlot and Chambourcin with a touch of bright blueberry flavors that make this a great after dinner drink. It also goes well with chocolate desserts and strong cheeses, like Roquefort. This port-style dessert wine features blueberries from Blueberry Hill at Rosemont and is an exclusive, Club Only wine. To purchase online, simply sign into your account and it will show in the “Sweet Wine” section. When will this be available to purchase? The Tartan is now available to purchase! For Club Members, simply log into your account and it will show up under our “Sweet Wine” section. Any idea when the Tartan will become available again? We’re dying to try it! We hope to have our next batch available mid-2019. Stay tuned to our website and Facebook pages for more details! Better get this first weekend released, I know a few people who will kindly make it unavailable quick. not fair to describe as a desert wine. I have no taste for sweet, yet this is more in line with a port and is extremely delicious! Hard to cap this gem! If you have little willpower you shall find the bottle empty!